So you have credit card debt, overdue mortgage payments, or suddenly need to buy a new car. We’ve all been there. You need money now, and your retirement accounts continue to climb. Fortunately, many employers allow you to take out loans on these accounts, but should you really begin spending that money before you retire? On one hand, there are benefits to borrowing from your retirement accounts. You are essentially borrowing your own money, so the payments you make, plus interest, go back into your account. Since it’s your own money, these payments do not affect your credit score, and most 401(k) loans have relatively low interest rates. 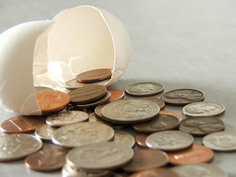 However, there are many risks associated with taking money from accounts like your 401(k). It is recommended that you see a financial advisor before making this decision to address the cost and potential ramifications of the loan. First consider the reason for taking out a loan, and the multiple options that you face. A dire emergency is the only recommended cause for borrowing from these accounts; some plans even require it. If you’re looking to spend the money on something more frivolous, like a family vacation or a new entertainment system, however, you should consider alternate financing options. The downside to these loans comes in handling the repayment plan. Interest paid to your own account sounds easy enough, but these payments are subject to taxes. Furthermore, once money is borrowed from your retirement account, it is no longer eligible for tax-deferred growth. Payments you make on the loan come from after-tax assets, so the money you repay into your account can end up getting taxed for a second time once you withdraw after retirement. A standard 401(k) loan allows you to borrow up to half of your balance, with a maximum of $50,000. Normally, you have up to five years to repay the loan. Failure to do so within the five-year period means your loan will be deemed an early withdrawal, and will be subject to taxes as well as a 10% early withdrawal penalty. If you are looking to borrow money from your retirement accounts, carefully consider your repayment plan in advance. It’s especially important to make certainthat you are secure in your employment; if you leave or lose your job, your loan payments will be due within 90 days. Consider borrowing only if interest on a loan from your retirement plan would be less than that of another loan alternative. A final tip: Continue contributing to your 401(k) while you pay off the loan to lessen the impact on your savings.